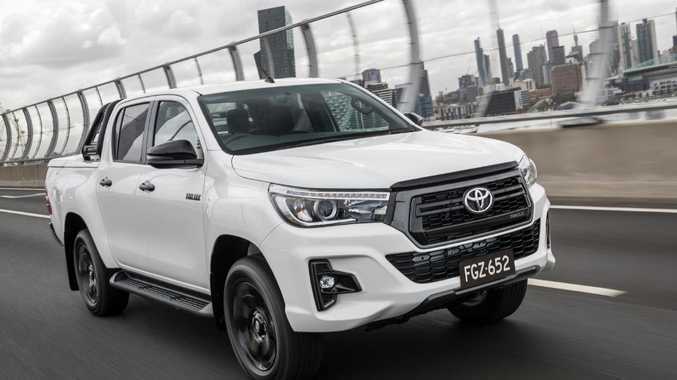 TOYOTA'S cashing in on HiLux being Australia's best-selling car, revealing the accessory-laden off-road-ready Rugged and street-tough blackened Rogue models. Our family of four tests the showy - and pricey - HiLux Rogue to see if it's as lifestyle-ready as it claims. 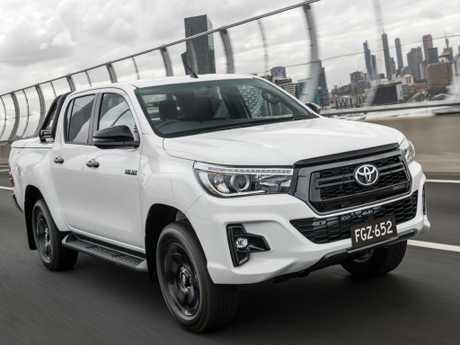 Iain: Toyota's HiLux is going to be Australia's best-selling car again. Jules: It's not a car, it's a truck. It shouldn't count. The HiLux Rogue has a high price tag. Iain: Try $61,690 before on-roads. It's got the bits the cool kids want. 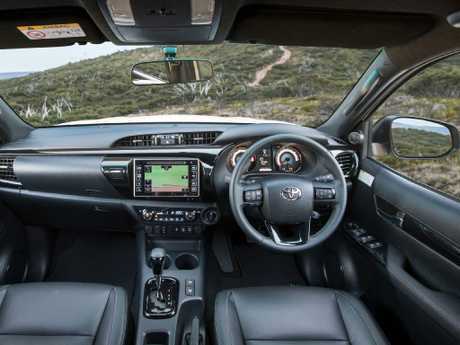 It's based on the flagship HiLux SR5 and you get leather seats, auto gearbox and satnav. J ules: What's made this one "go Rogue" then? Iain: You get a restyled front bumper and black honeycomb grille, LED fog lamps, grey rear bumper with larger step, towball, black door handles and mirrors - and, the big one, a hard tonneau cover on gas struts. Jules: Rogue's for show-offs then? Iain: Yep. 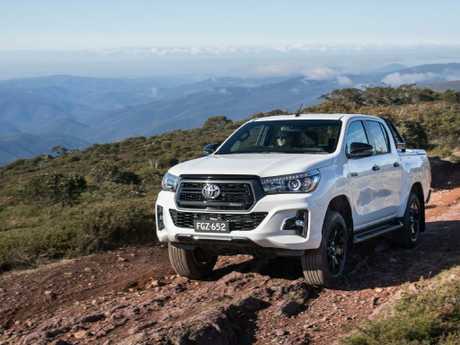 Toyota says it's a "premium recreational ute with a sports aesthetic". Jules: I like how huge double cabs are inside; you're hardly short of space. The Rogue’s infotainment technology is sub-par. Iain: It's cool having keyless entry and push-button start but there's no digital speedo. Iain: Some rivals have more power and torque. 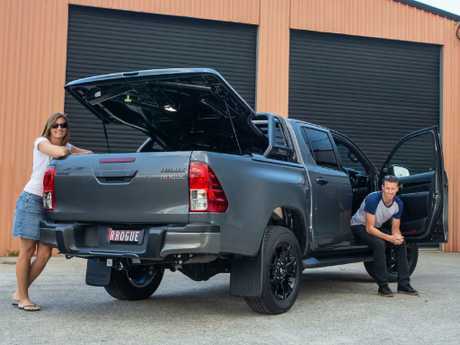 The Rogue's more than 100kg heavier than a normal HiLux SR5, stunting its performance further. Jules: It made me feel sick when it went over bumps. It's a bouncy thing. The Rogue has a lockable rear tray. Picture: Supplied. Jules: Manoeuvring a dual-cab is a nightmare. I had to park with two free spaces around me. It's huge. Jules: I still put the groceries in the rear footwells. If a bag of shopping moves around, you've got to climb into the tray to fetch it from the back. Iain: It's a big rig but vision is superb as you sit up so high. The rear camera is much needed for reverse parking. Jules: It is an excellent weekend getaway ute. Underneath the hard tonneau there's quality carpet that's really grippy. Iain: It's marine grade carpet, UV and water-resistant. Ideal to throw the wet gear on after a weekend of camping and jet skiing. Jules: You're definitely going to see Rogues by lakes towing a boat or jet ski rather than off-roading. Or, perish the thought, at a work site. Iain: It'll tow 3200kg with this auto gearbox but it's also properly talented off-road. I've tested the SR5 up mountains and on deep soft sand. It's superb, in both low and high-range. Jules: But it should behave better on road. It's very wallowy and the tyres were squealy in corners. Jules: Loads of room in the back for kids' car seats and you could fit an adult between them. That's excellent. The HiLux has a better ride with a load in the back. Iain: The kids' bikes went in the tray easily and the hardtop closed fine. For such duties, a HiLux is brilliant. Iain: Family-wise the economy was acceptable - we returned 9.4L/100km - but six-monthly services are a pain. Jules: There are plenty of airbags but the Rogue doesn't have such advanced safety tech as autonomous emergency braking. Not great for family duties. Iain: The Rogue's a good-looking thing. If I were a single, cashed-up tradie, it'd be ideal for a trip to the snow, mountain biking or jet skiing. It's just not as bad boy "rogue" as, say, a Ford Ranger Raptor. They're $75,000 though. Jules: For weekends, I'd love a dual-cab ute and the Rogue is tough enough. But it'd need to be a second car. It's just too cumbersome, bouncy and expensive for daily duties.